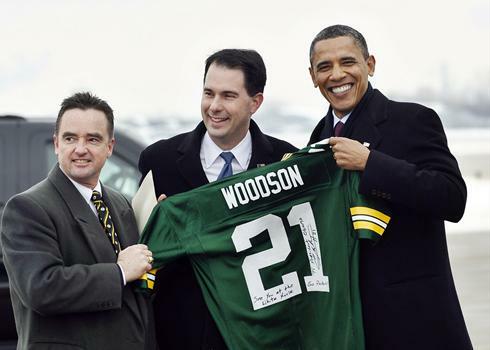 Road to the Super Bowl - 11 Days Away ~ The Bucky Channel - The World of Sports from Wisconsin's Perspective. 1. Eleven More Days Of Insanely Pointless Stories - Now that John Stone has been hired by another dealership, we can all go back to our normal lives and get ready for the Super Bowl matchup itself. Or, maybe not quite yet. We still have a few days to go before the teams fly out to Dallas and the focus really starts turning to X's and O's, but until then we'll have to bide our time with stories about Clay Matthews' new endorsement deal with Suave and the fact that the Super Bowl is good for Green Bay area businesses (trust me, "fill in the blank is good for local businesses" is a local news station favorite). While these stories are all good and fine, I was a little frustrated about the issue of the players not injured reserve not being able to be a part of the team picture. Not so much the fact that those were the circumstances, but the fact that it was even a story. Thankfully that one has been put to rest, as the team photo will now be taken on Friday and will include everyone. Maybe I'm just not paying enough attention to Pittsburgh media, but it seems like all of these goofy stories are coming out about the Packers and the Packers only. Now these stories are nothing compared to the Eugene Robinson stripper and Barret Robbins jaunt to Tijuana news items, but they could be come distractions nonetheless. Just something for me to sort of worry about as we're eleven days away from the Super Bowl. 2. Preparing Without Pouncey - As for the actual on-the-field happenings though, I think at this point Steelers fans have a bit more to worry about. Pittsburgh guard Chris Kemoeatu says that Maurkice Pouncey, the all-star rookie center who suffered a high ankle sprain in the AFC Championship Game, will in fact be out for the Super Bowl. You never root for a guy to be legitimately injured, but the absence of Pouncey would definitely be a positive for the Packers defense, especially B.J. Raji who would be apt to face him. I'm not sure definitively if Pouncey is really out, but getting ready to go after a high ankle sprain is a tall order to achieve in just two weeks. 3. Gilbert Brown and Lingerie - Fourteen years ago to the day, Gilbert Brown helped the Green Bay Packers win Super Bowl XXXI. Whether or not the Packers win next Sunday, Brown is hoping to bring another title back to Titletown this fall. Gilbert Brown has been named the head coach of the yet-to-be-named expansion team in the Lingerie Football League that will be based in Green Bay. The name of the team will be determined by the fans, and the team will play at least two home games at the Resch Center, but those are really all the specifics that we know so far. As for their coach, Gilbert Brown's post-NFL life keeps getting stranger and stranger. He was the coach a few years back for the now-defunct Milwaukee Bonecrushers of the CIFL (they have since moved to Chicago), and he now still coaches in the spring and summer for the La Crosse Spartans of the IFL. The Spartans were 3-11 last season, so how good of a coach GilbertBurger is remains to be seen. Maybe he's just better at coaching chicks in their underwear than he is coaching actual football players. We'll see. And for you prop bet junkies out there, Stock Lemon has their take on who to tab for the game's MVP award.